The U.S. Empire is in real trouble. This is due to its idiotic business model of selling quality assets while acquiring massive liabilities and debts. Of course, the U.S. Government realizes this is not a sustainable way to do business, but at least for now…. we continue to have our Bread & Circuses, McDonalds & NFL Football for a bit longer. 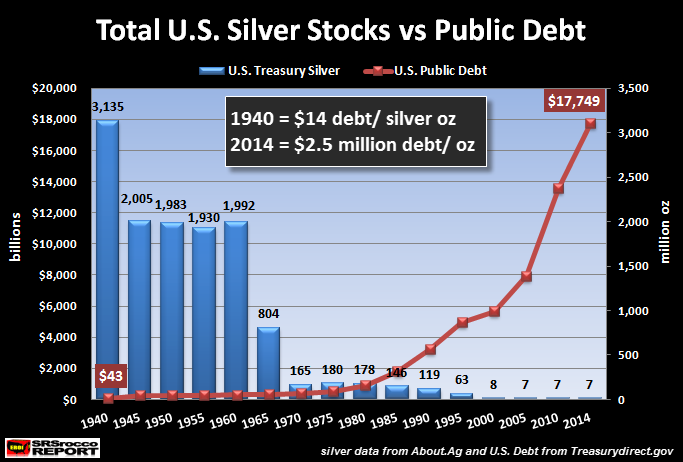 This next chart shows the massive decline in U.S. silver stocks from 1940 to present. As you can see, silver stocks at the U.S. Treasury declined from 3.1 billion ounces in 1940 to 7 million ounces currently. This is a staggering 99.99% decline. This entry was posted in news and tagged economic collapse, government silver stocks, silver manipulation, silver stocks on September 22, 2014 by Site Admin.